I had planned to do a series of quick to make Christmas patterns, but as usual, things have not gone as I planned. 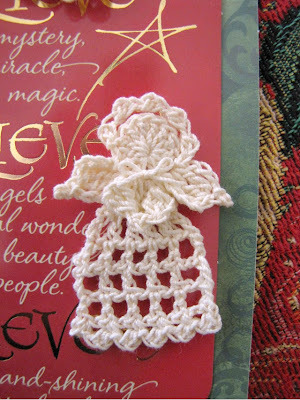 But I do want to share with you the pattern for this sweet little angel. She is tiny, only about 2 1/2" long, but she makes a cute ornament for the tree or a nice little surprise to tuck into a Christmas card. I designed an Angel similar to this one a few years ago as part of a set of bookmarks I was making at the time. My daughter, Bethany pointed out that the earlier version had no arms, poor thing! This new and improved version does have arms, so I hope Bethany will approve! The pattern requires knowledge of the basic crochet stitches, plus how to make both tr clusters and dc clusters, so it has a skill level of Intermediate. Still, it is very quick to make, and not really hard, just a little involved. After you make the first one, each following one will go much quicker! D: For Halo, (ch 2, hdc in 2nd ch from hook) 5 times, sl st in last st of Rnd 1, fasten off. Row 3: Join with sl st in top of first ch-3 on Dress Foundation, ch 4 (counts as first dc and ch 1), dc in next dc, (ch 1, dc in next dc) 4 times, turn. Rows 4-6: Ch 4, dc in next dc, (ch 1, dc in next dc) across, turn. Row 7: Ch 1, sc in first st, (ch 2, hdc in 2nd ch from hook, sc in next dc) across. Fasten off. For Arms, ch 3, 2 dc cluster (see Special Stitches) in 3rd ch from hook, ch 2, sc in second ch from hook (for hands), ch 3, 2 dc cluster in 3rd ch from hook, ch 1. Fasten off. Place Arms on Angel as shown, glue in place. Spray Angel with heavy starch and allow to dry. For Bow, tie a 6" strand of thread into a bow; glue to Row 2 between Wings. Trim ends of thread. If desired, for hanging loop, glue ends of a folded 8" strand of thread to back of Rnd 1. Merry Christmas! I hope you will enjoy her! Update on Dec. 15, 2016: I want to thank everyone who has visited this page since the pattern was published 7 years ago; it has become the most visited page on my blog! "Thank you for your “Tiny Christmas Angel” from 2009. I first made your pattern 2 ½ years ago. Liked it so much, I made a bunch. My craft circle friends said, “You should join them together and make them into a garland”. So I did! I did not give each one a bow or hands as your pattern does, but I still made over 400 of them to decorate my tree." I think it is adorable! Thank you, Helen!!! Copyright BellaCrochet, 2009. All rights reserved. So tiny and cute! Thanks Ann! She is really cute! Can't wait to make up a few of these -- maybe even use them as gift tag holders!!! This is so adorable! You are so kind to share. Thank you very much Ann she is sweet and can be used anytime of the year ^j^ Thank you very much! Thank you for sharing...love angels in thread! 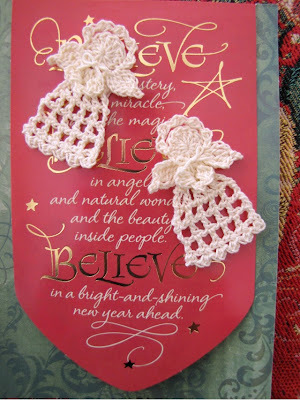 Thanks for sharing.....I love to crochet thread angels! Thank you for sharing.Is adorable!! 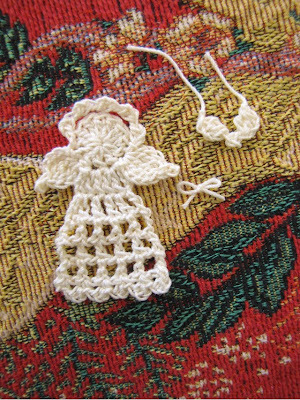 Love this little angel, I will use it for embellishing a ornament. Thank you Elizabeth.